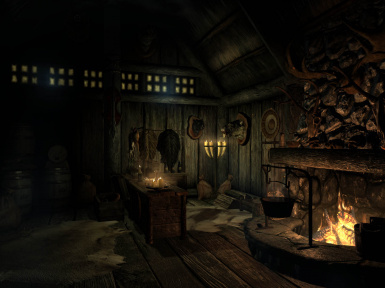 Quest-driven replacement of the 4 ruined buildings in Winterhold with 3 new merchants and an optional player-house. Merchants are wealthy and sell useful items always. This mod is the creative property of the author. The author does NOT give permission for re-uploading this mod, edits/renditions/merges of this mod on this or any other website(s). Translations and patches may not contain my files. If you see this mod anywhere but but here please report it. - Crate & barrel clutter between curio shop and inn. - "Ice Veins" is dead, but his ghost continues on. - FIX: "Uncle Emory's Necklace" wasn't removed from inventory if player turned down option to buy Coldstone Manor. 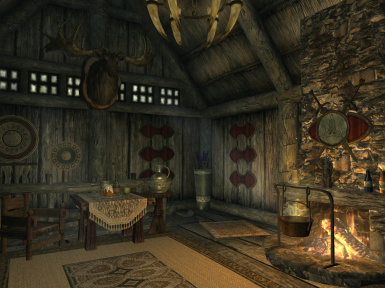 - FIX: Winterhold home locations incorrectly tagged as "Morthal Location"
- Xhem race changed. Some players have trouble speaking to the "Elderly Vampire Race"
WINTERHOLD REBUILD: is quest-driven repair of the four damaged houses in the town of Winterhold. To see the town rebuilt, lend a hand to the lead carpenter Avis. He works outside on one of the buildings being rebuilt from 6am to 8pm. At night you can find him in the Frozen Hearth Inn. This mod does not edit the College or their bridge. 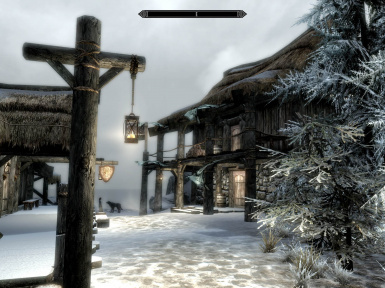 I created this mod to make Winterhold more useful; not necessarily for immersion purposes. Immersion is subjective, and I am not responsible for variances in player needs in this area. PLAYER HOME purchase will be an option at the end of your quest, but not mandatory. Coldstone Manor is simple, affordable, and matches the town. The housecarl has her own room in the cellar, separated from your living space. Both sections of Coldstone are safe for storage, but use the latest version to be sure. NEW MERCHANTS: include a blacksmith, an apothecary/magical goods shop, and a new general goods store. Merchants are protected, but not essential. See "Known issues" below. - Compatibility and integration is the responsibility of each player. 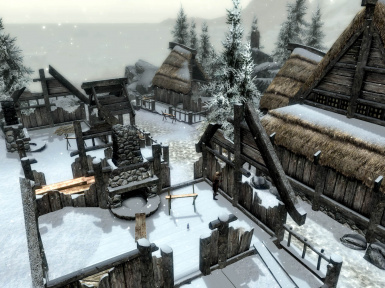 There are over 50,000 Skyrim mods, and I don't have time to check compatibility for you. 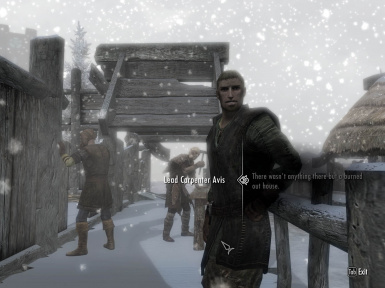 - Incompatible with almost every other Winterhold TOWN mod. 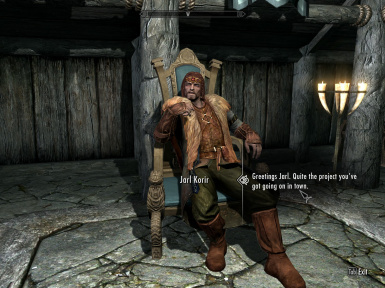 Minor clipping issues with JK's Winterhold. 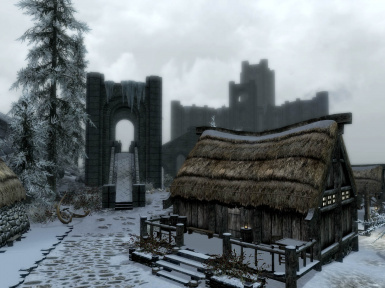 - This mod does not edit The College of Winterhold or the bridge; just the town. - This mod is PC only. - See "Known Issues" below. UPDATE INFO: See the "LOGS" tab for details. 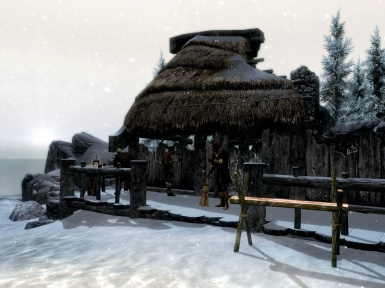 PATCHES: Interesting NPCs and ETaC both have patches to play with other Winterhold mods. 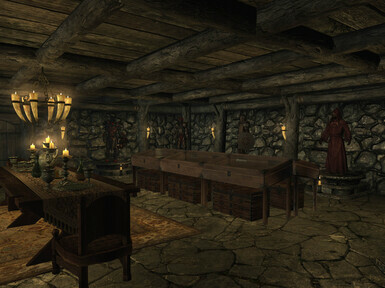 - During the quest in this mod there is a horse. If you don't want to own a horse, simply walk up to the location marked in your quest journal so that the quest can advance, and return to Avis without getting on the horse. - Merchants have 10x the usual amount of coin. The smith for example, will have about 10k gold. Using mods that increase merchant gold may cause the so-called "Gold Bug", where merchants with over 20k gold will not work correctly. This is a compatibility issue, and not something I consider a bug in the mod itself. - Teleport home spell: Using the "Teleport to Coldstone" spell to leave a quest-locked area can cause trouble. This includes Skuldafn, Dustman's Cairn, Azura's Star, etc. Teleport responsibly. MAIN PROJECT: QAXE'S QUESTORIUM! Try it! It's good! 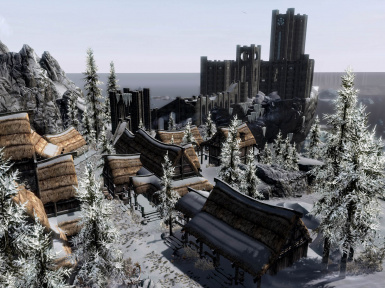 PERMISSIONS: Qaxe's Winterhold Rebuild was provided by the author for free game-play use only, and is the creative property of the author. The author does NOT give permission for use of any part of this mod to this or any other website(s). Uploading edits, renditions, merges or “fixes” of Qaxe's Winterhold Rebuild is strictly prohibited. Permissions are non-negotiable. Sharing patches is great, just do not include my files along with your patch. Conditions for Translators: Translations may not include any files from Qaxe's Winterhold Rebuild other than those being translated! Post your translated .esp file along with a link to the original mod page. Players will need to download my original mod and your translation separately.